Taking a break from Fantasy Costuming various shows with a brand that has appeared on New Girl, The Mindy Project, Parks and Recreation and How to Get Away with Murder; Alice + Olivia has the cutest sweaters. This collection was about a lot more than knitwear with designer Stacey Bendet striking a balance between late 60s/early 70s boho and rocker; a strong theme for this NYFW and one discussed yesterday with our Red Valentino Sally Draper Fantasy Costuming. This post is a mixture of looks from the show and the stars in attendance (some are wearing items available from Alice + Olivia at the moment). Okay there might be some suggestions of what shows some of the pieces should appear on/who should wear them; it is hard to resist the urge to Fantasy Costume. If you are a regular TV Ate My Wardrobe reader you will know by now that I have very strong feelings about lady tuxes and the current menswear trend. So it might not be too surprising that this simple and sophisticated take on this theme is top of the list. Keri Russell sometimes leans towards this style on the red carpet and even though it is not vintage the pants have a hint of wide legged Elizabeth Jennings about them. Below are several more outfits from the collection to drool over with pattern and texture reigning supreme – click on the image for a closer look. Jenny Slate will be glad to see the turtleneck is making big waves this NYFW and the first dress in the collection below has a hint of Joan Watson about it. And now for a few looks from those at the show. Singer Kate Nash went for bold color and pattern in a stunning multicolored ‘Bryn’ skirt pairing it with a very cute zebra sweater. Sarah Silverman put a bird on it and makeup artist Tina Turnbow shared this beautiful close up getting ready shot. 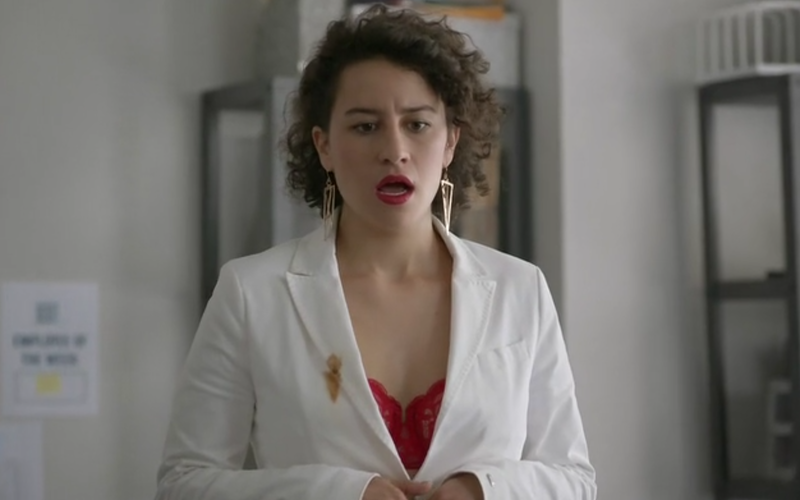 Hopefully Ilana Glazer will fare better in white than when her Broad City character last wore something similar to this. 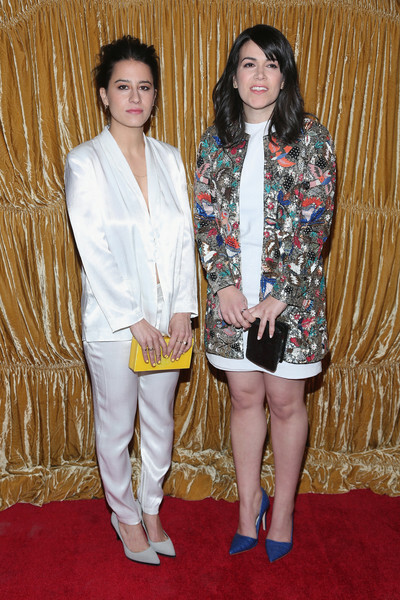 Abbi Jacobson’s embellished bird jacket is incredible and she adds an extra pop of color with blue stilettos. Fashion blogger and model Ella Catliff beats the New York cold with stylish layering including the ‘Shih’ collarless coat and pairing tights with these wedges means no freezing toes in the name of fashion. It’s “Look of the Week” time! Once again there has been a rich amount of different costumes across various shows this week. This is a snapshot of what I have been watching and each pick is for a variety of reasons including; what it adds to the storyline, what it tells us about the characters involved or simply because it looks good. This week we take a look at a couple of season finales and it is an all female edition. Near misses include the many flashback looks of New Girl and the return of Bert Macklin on Parks and Recreation. The costume design on The Good Wife is flawless; from Diane’s epic statement jewellery to the tailored perfection of Alicia’s courtroom suits. Daniel Lawson who is the man behind these pieces writes an episode-by-episode column for InStyle and explains how he alters certain outfits and discusses the reasons behind his costume choices. Color is really important on The Good Wife and we have seen red used on multiple occasions to express how Alicia is feeling and this can impact the mood of the scene. Lawson explains that this Antonio Berardi dress was chosen because “Julianna and I didn’t want her to look like the typical candidate’s wife.” It’s a simple black dress with a twist and this is indicative of this final moment where it looks like Alicia is meeting Will, but instead she is making a huge move in regards to her career. Bonus points go to the bold lip color (which I now really want – no surprise there). This was an excellent way to end the season and I cannot wait to see what the costume department brings us with all the change that is coming in season 5. 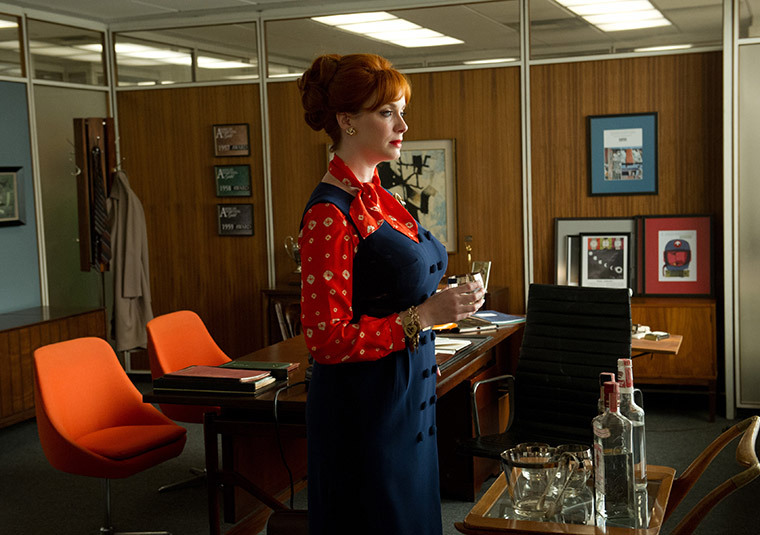 Every week I could simply write Janie Bryant is a genius as she continues to work her costume magic on Mad Men. 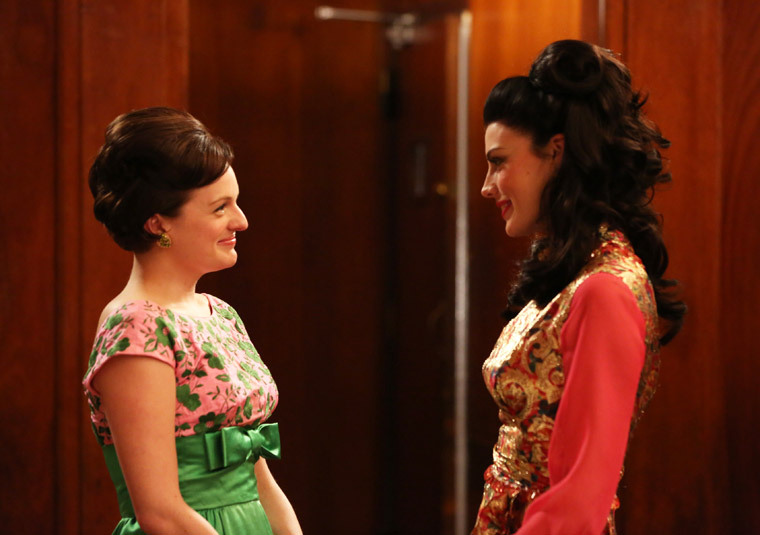 In this scene Megan and Peggy are at an awards ceremony and both are in bold patterns that the late 60s is famous for. This isn’t a period for a wallflower when it comes to fashion and even Peggy is embracing the trend. Peggy’s dress is not as fashion forward as Megan’s and she is still playing it safe with bows and flowers. Megan is an actress after all (even though she is up for an advertising award) and so she is wearing the most flamboyant dress of all the female characters we see. It has an I Dream of Jeannie feel and even though these two women clash in both pattern and color there is warmth to this scene and between these two characters. I would love to see more interaction between Peggy and Megan as they could both benefit from a close friendship. The costuming in this moment contrasts with the rest of the episode after the news of Martin Luther King, Jr’s death is announced and the far away place the Megan’s dress evokes is just a fantasy. 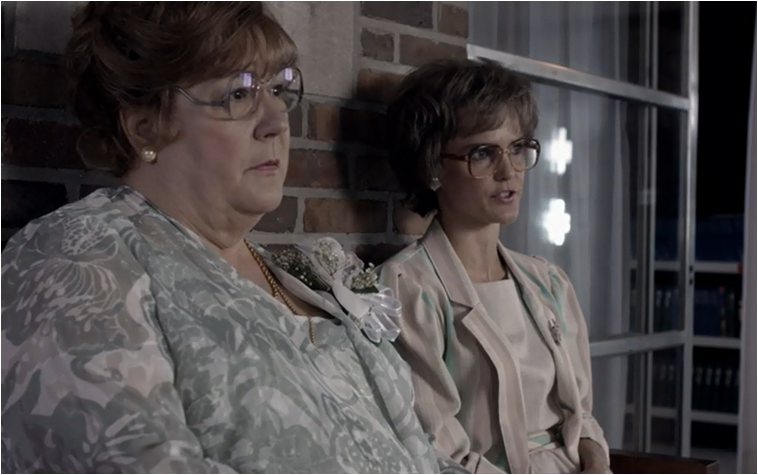 This is the third week in a row that Elizabeth Jennings from The Americans has featured on the list, but as it is the season 1 finale it felt appropriate for the show with the best wigs and disguises on TV to appear once again. This look is pretty similar to how Elizabeth usually appears, her hair is blonder and those aviators are not something Elizabeth would wear but other than that it’s not an elaborate disguise. It’s on this occasion that Elizabeth is closest to being caught by the FBI and if she had been apprehended it wouldn’t have taken Stan very long to ID her. It’s also fun to see how quick Elizabeth and Philip can shed their disguises and hopefully in season 2 they will show the process of how they become someone else. The Americans is so much more than wigs and costumes, but these aspects add a layer of fun to this spy drama.